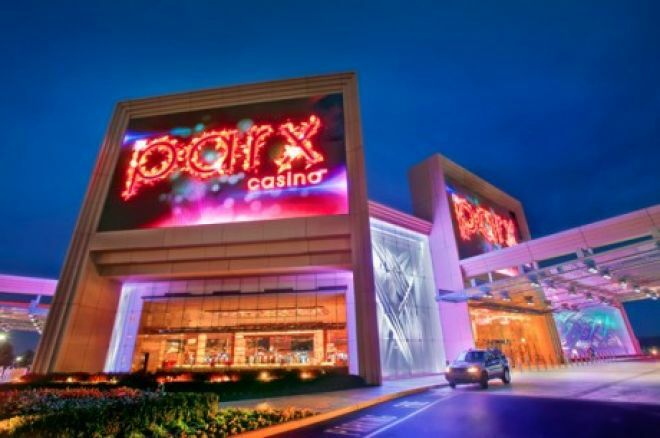 Despite carefully preparing for the Parx Big Stax V $330 reentry event last week, I was unable to survive Day 1c, hitting the rail roughly an hour after the dinner break. I was in a very good mental place entering the tournament, and I was luckily able to chip up during the first few levels, but quickly hit a wall, plateaued, and plummeted. Among the dozens of hands I played, there are three that I believe are worth discussing. Unfortunately, there is only one hand among these three that I think I played well, but hopefully we can both learn a thing or two by breaking each of them down. In this particular hand, he raised to 600, the player in the small blind folded, and I looked down at in the big blind — one of those “trouble hands” about which Neil Gibson was writing last week. Folding isn’t an option with this strong of a hand, and I don’t believe I am getting extra value by reraising in this spot, so I called. The flop was about as good as it gets for me — . I checked, the player tossed out a continuation bet of 1,000, and I opted to call. There is an argument for check-raising in this spot, but only if I am certain my opponent has a very strong hand. If he is continuing with air, which he has proven he can do in a previous hand, then check-raising will only allow him to fold. The turn was a , I checked again, and the player doubled his previous bet — a strategy many amateur players employ. The argument for check-raising in this spot is a bit stronger than it was on the flop because we want to start maximizing our value, but again I thought that the odds of him calling a check-raise on the turn and then a betting on the river with a hand worse than mine were much less than the odds of him misfiring another bluff-barrel on the river. I called. The river was the — BINGO (!) — giving me the nuts and putting a potential diamond flush on board. Now... what to do? If I lead out, there are only a few hands that are going to give me value: , , , , , , and maybe . It’s really hard for him to have a king in his hand because we know three of the four are out of the deck, and even if you include those eight combinations of hands with a king, this range is very small. If I check, he will probably check his hands and for value, but I don’t think he is ever checking behind with a flush, even on a paired board. I also think there are still bluffs in his range with which he will stubbornly continue. Thus I checked, and he promptly tossed out a T5,000 chip, leaving roughly 16,000 behind. He didn’t give a stare like the last time he three-barreled, which I thought was significant but perhaps not life-altering. He could have still been bluffing, realizing that his “look” didn’t work last time, or he could have been trying to disguise the fact he really did have a strong hand. I decided if this player was going to commit another 5,000 chips — the minimum amount I could raise — he was going to call an all-in bet. Unless he is the most Curious George of them all, I don’t know if there are any hands with which he could call a min-raise that wouldn’t be strong enough with which to call a shove. Also worth pointing out is the fact that the tournament was a reentry event, meaning there was a chance that he would just stick the rest of his stack in the middle and head back to tournament registration. I moved all in, silently placing the rest of my stack across the betting line, and the player reviewed the board for a brief amount of time before folding. It seems to me that he was bluffing, and I squeezed as much value as possible out of this hand. After the dinner break I found myself with just over 25 big blinds with the blinds at 600/1,200 with a 200 ante. That’s when an active player raised to 3,000 from under the gun, then another active player called from a seat over. Incidentally, both of these active gents flopped quads prior to the dinner break and had well over 100,000 chips. The action folded to me in the cutoff. I woke up with , and opted to move all in for roughly 30,000. This is an extremely large three-bet shove, and I still don’t know if it was a wise decision. If I made more of a standard reraise, making it around 9,000 or so, that would have put 18,600 in the middle and left me with 21,000 behind. The raiser and the caller would see they were getting 3-to-1 on a call and likely try to see a flop, only to check-fold at a high frequency. They could also fold, or reraise-shove over the top. I didn’t think their shoving range was overly wide, but I would have happily called all in before the flop with the third best pair in hold’em. My decision to reraise all in right there was based purely on the two players in the hand, both of whom I played with all day. The original raiser had the most chips at the table and was always willing to call my opening raises both in position and out of the blinds. Meanwhile the caller on his left was a thinking player, and I really thought a shove would set off alarm bells in his head, allowing him to call with a lot of middling pairs and even some weaker aces like -suited and -suited if the original raiser folded. I thought also that he would just fold these types of hands to a normal three-bet, because my stack was so small and he couldn’t maximize his value if he smashed the flop. The action folded back to the original raiser, who went into the tank for a considerable amount of time. He eventually folded, then the player to his left paused to think. I was silently staring at a single spot on the felt, and out of the corner of my eye I saw him assemble enough chips to make the call. But he too slid his cards into the muck, appearing as though he was very unhappy about folding. The very next hand, all three of us were not involved in the pot, and the flop was . “I would’ve really liked that flop last hand,” the original raiser chuckled. “Me, too,” the caller quipped. The two players went back and forth, bouncing up and down on a sort of one-upper see-saw, until they realized that they had both folded pocket nines! I don’t know if one or both of these players would have called a standard three-bet with more often than they would call my shove. That obviously would have been a dream scenario, since neither could have outflopped me. I don’t know if it was because of fatigue, but I lost my focus on my final hand. With the clock dwindling down, I posted my small blind of 800 at 800/1,600/200, but by the time the action folded to me I thought we were playing 1,000/2,000/300. The clock was right in my face — a giant blue screen. And I had just posted my small blind. And yet, my mind had wandered elsewhere. With , I moved all in for 28,500, thinking it was 14 big blinds, and the player in the big blind tank-called with . The gentleman, who was new to the table, was extremely close to folding. The board produced all blanks, and as I made my exit from the table I realized my mistake. How stupid could I be? Just because you prepare for the beginning of the day, that doesn’t mean you can allow your mind to drift during the heat of the battle. If you do, then all of your preparation is for naught. It’s a lesson I’ve learned before, and which I plan to keep in mind going forward. I write just before heading back to Parx once again to play in the $1,600 buy-in Main Event, thanks to a handful of investors. I will certainly report any interesting hands or happenings from that tournament soon on Learn.PokerNews.